We go back to the king of music in the '60s townships for today's offering. 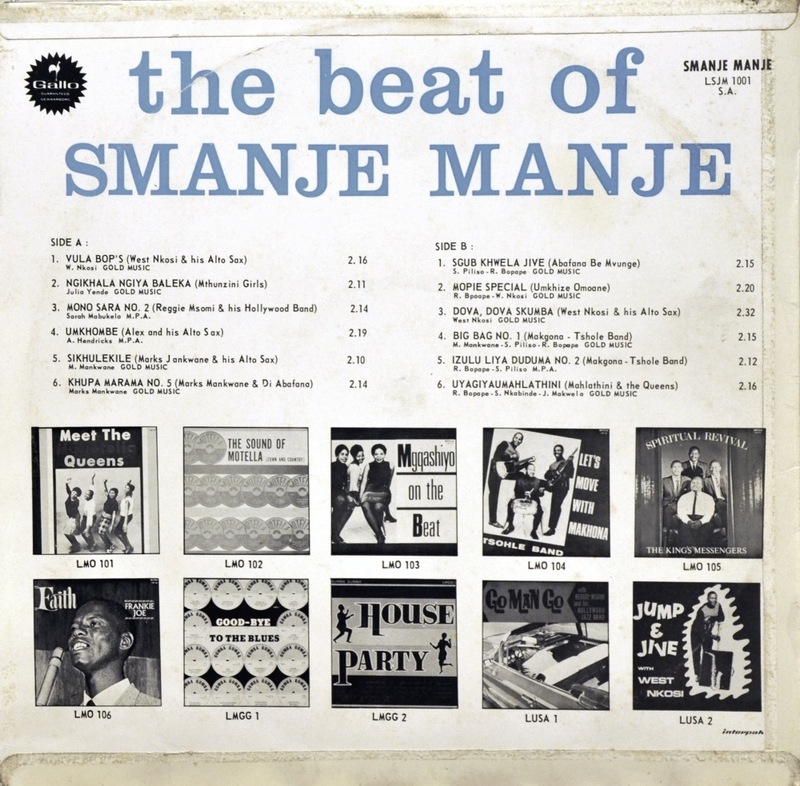 The 1968 compilation The Beat of Smanje Manje brings together twelve memorable tunes originally released on singles on the "Smanje Manje" label - and all twelve of them are true gems. 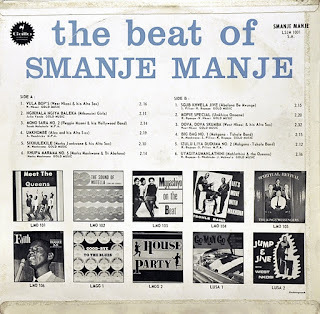 Hot on the heels of Good Luck Motella, Marena, and all of those "cream of the crop" Mavuthela Music Company compilation LPs, The Beat of Smanje Manje collates some of the most exhilarating 1960s mbaqanga one could ever hope to stumble across. The likes of West Nkosi, Marks Mankwane, Reggie Msomi and Alex Hendricks (a more mature, saxophone-bearing version of the 1950s/60s kwela star "Little Kid Lex") throw up some damn-near fantastic and rocking sax jives, featuring that tight-knitted trademark electric mbaqanga sound. Guest appearances are made by Julia Yende's Mthunzini Girls, as well as great groaner Mahlathini, both of whom team up for the beautiful "Ngikhala Ngiya Baleka", one of the big mbaqanga hits of the late '60s. 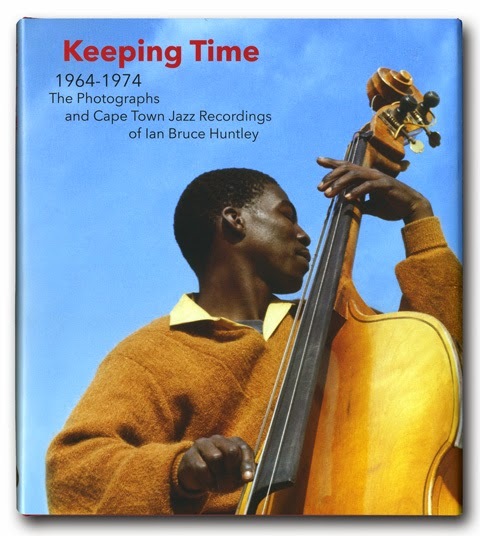 "Vula Bop's", the number that opens this LP, may well just be the perfect example of this kind of music. Joseph Makwela, plucking his electric bass, introduces the tune and, before you know it, is immediately accompanied by Lucky Monama on drums, the oft-underrated professional Vivian Ngubane (on his super-bouncy rhythm guitar), Marks Mankwane playing lilting lead guitar licks, and resident hornblower West Nkosi blowing the alto sax for Africa. The track's title references Mavuthela director/producer Rupert Bopape (who was nicknamed "Bop's" in the Gallo studios), and was released in opposition to "Vala Nzimande", a sax jive song that emanated from GRC's Isibaya Esikhulu Music, so-named after its producer Hamilton Nzimande. We have often mentioned the Mthunzini Girls and the strong vocals of its leader, Julia Yende, so we'll say no more about them and leave you enjoying the group's biggest hit, "Ngikhala Ngiya Baleka", a soulful and jive-tastic ballad in which every musician in the studio fires on all cylinders. Reggie Msomi enters the fray with his Hollywood Jazz Band for just one number, but it's a goodie: "Mono Sara No. 2". The song is an instrumental re-recording of a 1964 Mahotella Queens number, "Mono Sarah Nani", a Shona-language song arranged by then-regular vocalist Sarah Mabokela. "Izulu Liya Duduma No. 2" is a must for all listeners... the Makgona Tsohle Band lives up to its name here and delivers the goods with immense ease. It is another instrumental cover of another big hit, which can be found opening the LP Good Luck Motella. This cover song is one not to be skipped past! This music is just sublime. From a personal point of view, this was one of the first LPs I came across after getting into this music, so the songs here have a particular resonance with me. 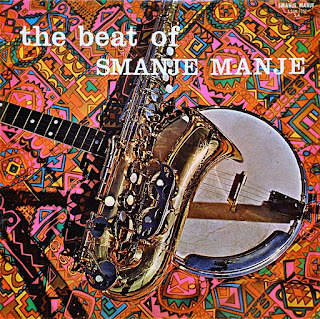 Nothing more now needs to be said - all you have to do is download this LP and strut your stuff with The Beat of Smanje Manje. Enjoy! Can't wait to listen to this one. Thanks a lot! Thanks. I love this blog. Sensational album; thanks so much! I am desperately looking for an Mbaqanga balladcalled Benny/ Bellie or something similar. Dont know who played it but iswas a mid to late sixties son... benny Ngoana batho, ok oa atamele.......Lefa go kaba jang, Benny ngoana me....... Anybody remembers this wonderful song? The hits mentioned above are so outstanding that one regretts the knowledge that the artists are now late Lalani ngoxolo kodwa niyibekile induku ebandla. How do I download this beautiful music please friends?